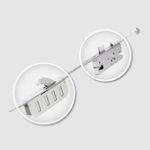 Individual locks, component parts, alternative strikes and keeps etc can be purchased through the section "01 Component Parts for Winkhaus Multi-Point Door Locks" below. Full lock sets including strikes and keeps can be purchased through the other sections. This section contains all of our Winkhaus Multi-Point door locks priced in lock only format together with individual component parts & spares. Cobra hookbolt locks & Thunderbolt twin deadbolt locks for single doors, FGTE Master & Slave door locks for double door sets, AV2 Automatic locks for "slam lock" applications, Stable Door locks plus shootbolts, strikeplates & keeps etc. 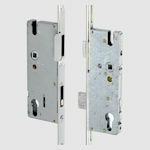 Our Winkhaus Cobra & Thunderbolt Multi-Point Lock systems offer simple lift-lever or cylinder only operation on single doors in short, standard & tall variants to accommodate a range of door heights while the Nemef Excellence range provides cylinder or lift-lever locking operation for more demanding, prestigious applications. Automatic locking on single doors can be achieved using the AV2 or AV2 Heritage locks making them a popular choice where lever door handles are not required. The Winkhaus Stable Door Lock is a purpose made two part lock system for timber & composite stable doors utilising the same features & performance characteristics of the popular Cobra multi-point lock system. The stable door lock features an upper section lock with lift-lever locking operation & a lower section lock with key turn activation. Cobra multi-point locks have been tested in all door framing materials to PAS24 Enhanced Security Standards & are approved by the Police " Secured by Design" security initiative. Whether it's a classic French Door leading onto the garden, an ultra modern door with an opening side panel or a "grand entrance" double door to suit a contemporary self build home, we have the solution. 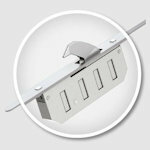 The Winkhaus FGTE Double Door Multi-Point Lock systems provides a range of options for applications where lever handles are required to both leaves while the FAB Flush Bolt system allows lever handle or cylinder only operation to the main leaf only. Automatic locking on double doors can be achieved using the FAB/AV2 system making it a popular choice where lever door handles are not required.